Three hundred years of Worcestershire’s social and Masonic history in ceramics, medals, coins, books, photographs and bric a brac. 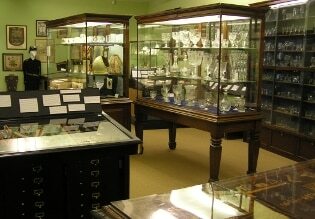 The Museum of Freemasonry in Worcester is accepted as being the second only to the Grand Lodge collection in London. It was founded in 1887 and amongst other artefacts includes a large collection of Masonic ceramics produced from factories in Sunderland, Leeds, Liverpool, Staffordshire and Worcester. The Museum also contains the internationally famous Shackles Collection of Masonic coins and medals from Europe and the Americas and a very large library of Masonic books and publications. The Library and Museum is usually open every Tuesday and Thursday from 10.00 am until 12.00 noon, except during the Christmas and New Year period. We will also be open on the second Saturday of the month from March to September, between the hours of 10.00 am and 4.00 pm. The Curator is very happy to open at other times by prior arrangement. Entry to the Library and Museum is free of charge.